Once you’ve stepped into a warm bath or stood in the shower for few minutes, your pores begin to open. Which allows whatever is laying on the surface of our skin or what we apply to sink deeper into it. When we add shaving to this equation the outer layer is exfoliated, revealing new fresh skin underneath. The skin is more tender and vulnerable to outside elements, including shaving cream. This post contains some affiliate links for your convenience, read the full disclosure policy. Why does it matter if your skin is more vulnerable while shaving? Well, the truth of the matter is most shaving creams are not good for the skin. Even those that are labeled as paraben-free or advertise that an essential oil is included. In most cases, there are still many harmful ingredients in the product and the heavily promoted essential oil is one of the last ingredients on the label. Which means there is barely any of it in the product. Turn your focus to the first handful of ingredients in a product and it will give you a bigger picture of what to expect. What Ingredients Should You Avoid in Shaving Creams? Learning how to truly read skin care product labels can be overwhelming. Use this quick list as a guide to help you decipher what’s inside the bottle. The following are all common ingredients found in shaving cream. This one might sound familiar. It’s the same chemical used to make Teflon non-stick cookware. You’ll find it listed as “PTFE” in shaving cream ingredients. What’s it doing in shaving cream? I’m not sure, but it is linked to a multitude of health issues including heart disease, breast cancer, and early-onset menopause (Mozes 2013). This is term on product labels companies use to get away with including a lot of chemicals – without including each on the label! How many you ask? 1000s of different ingredients under one term! Why? Because fragrance is considered a trade secret. Many of which are known carcinogens and endocrine disruptors (FDA 2011). Linked to hormone disruption and cancer, this ingredient is often found in skin care products that foam (EWG 2010). So, if you’re using a shaving cream that foams… it’s probably in there. Check the label for triethanolamine or (TEA). Present in a number of skin care products, sulfates are used to cleanse and help a product foam. You’ll find them listed as sodium lauryl sulfate (SLS), sodium laureth sulfate (SLES), and ammonium lauryl sulfate. Unfortunately, all are a harsh detergent and a strong skin irritant (Turkoglu, 1999). A toluene-based ingredient, butylated hydroxytoluene (BHT) is used as a preservative in skin care products including shaving creams. Toluene was rate the 37th most toxic chemical by the Federal Agency for Toxic Substances and Disease Registry. Linked to eye, skin, and lung irritation in addition to hormone disruption (Sciammacco 2014). With so many harmful ingredients found in shaving cream – why take the risk? While many believe shaving cream is only for men. I’m here to tell you – it’s quite incredible for women! 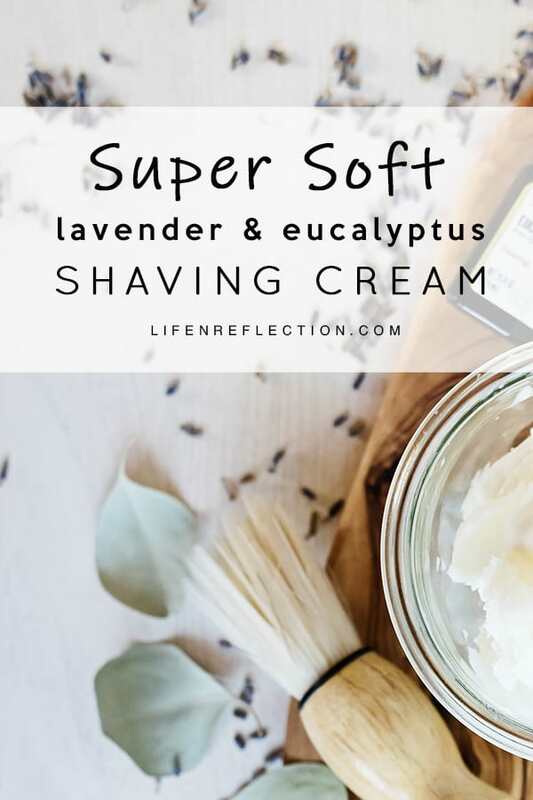 Your legs will feel softer than they’ve ever been after shaving when you use this DIY shaving cream! This recipe for whipped shaving cream does not lather or foam. It’s more of a cross between shaving soap and shaving oil. It feels like heavy body cream. So, apply it in a thin layer. A quarter size amount for each leg is plenty. A little really goes long way! I love the combination of lavender and eucalyptus essential oils. But, you can leave out the lavender essential oil and just increase the drops of eucalyptus. Or swap for cedarwood essential oil for a nice woodsy scent for him. In a double boiler, melt fourth a cup of coconut oil and a fourth cup of shea butter on medium heat until melted. Promptly remove from the heat and add two tablespoons of sweet almond oil. Whisk together and place in the fridge to cool. Let cool until mixture is the consistency of soft butter. Then remove from the fridge and using a hand mixer whip for one minute. 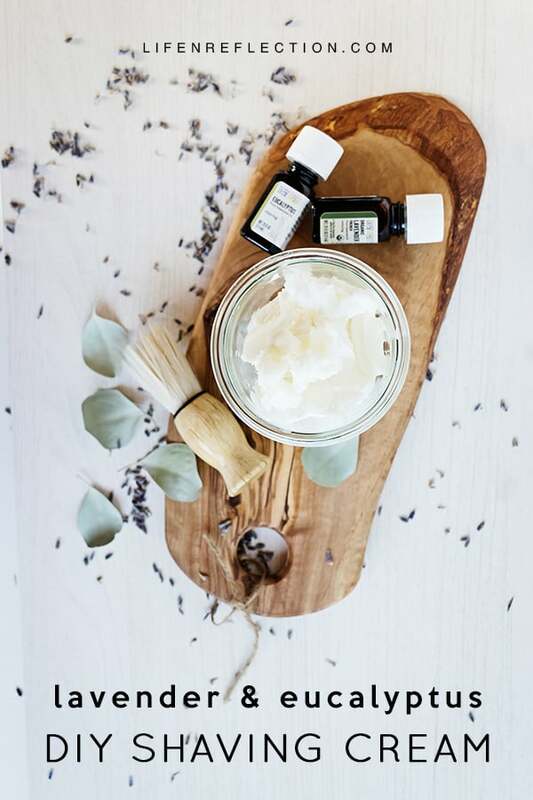 Add two drops eucalyptus essential oil and four drops french lavender essential oil to the cream. Whip using the hand mixer for one to two minutes. Store shaving cream in an airtight container. Yields: eight ounces. 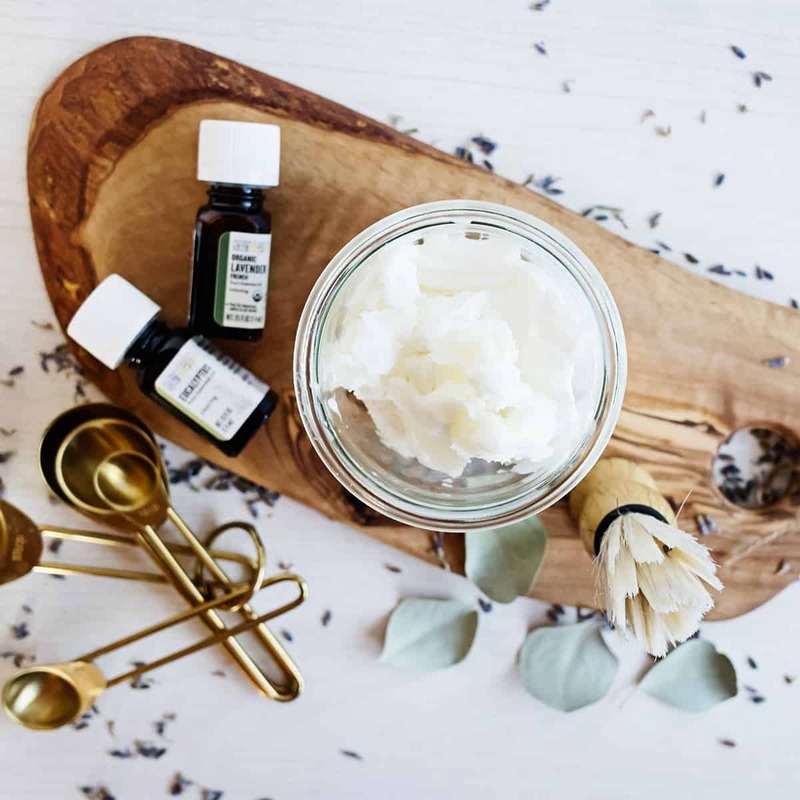 Please note this DIY shaving cream recipe can result in a slippery shower or bathtub. Less is more in this case! Let cool until mixture is the consistency of soft butter. Then remove from fridge and using a hand mixer whip for one minute. 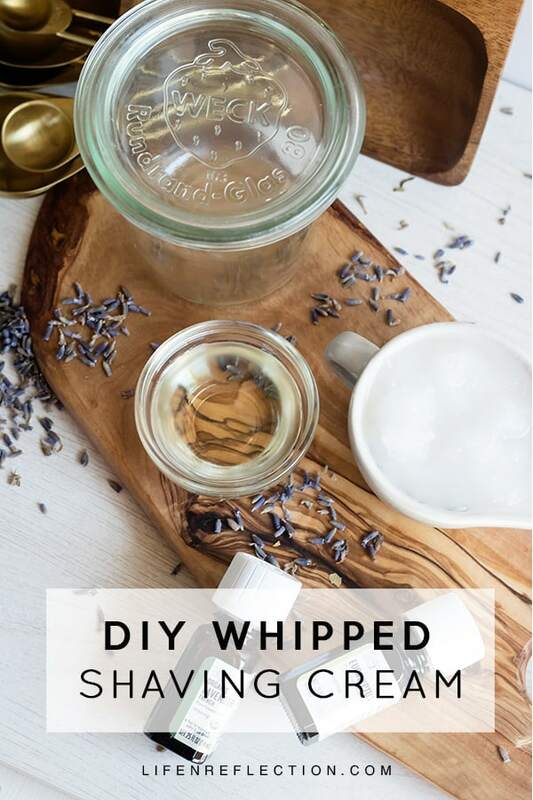 Add two drops eucalyptus essential oil and four drops french lavender essential oil to the cream. Whip using the hand mixer for one to two minutes. Store shaving cream in an airtight container. How do you apply shaving cream? Shaving upward A.K.A against the direction of hair growth will give you a closer shave. But, it’s inadvisable in the bikini are due to potential irritation, cuts, or nicks. And if your skin is notably dry or sensitive avoid shaving “against the grain”. No matter where you’re shaving wait until the end of your bath or shower. This allows the pores of your skin plenty of time to hydrate and warm up, resulting in less irritation. Rinse the blades of your razor while shaving, keeping the blades clean and ensuring a closer shave. Swish in the water of your bath or sink. Or let the water run through it in the shower. Use a quality razor like this one. Cheap disposable razors are not only bad for our environment they aren’t great for the skin either! This happens to be one those natural skin care recipes my friends keep asking me to make for them. It’s one of my favorites as well. You may like it so much you’ll never buy store-bought again either! Alan Mozes, “Chemicals in cookware, carpets may raise arthritis risk in women,” Health Day, February 14, 2013, http://wn.wjhg.com/story/21196098/chemicals-in-cookware-carpets-may-raise-arthritis-risk-in-women. “Spring Clean Your Cosmetics: Go Without These 6 Ingredients.” Environmental Working Group (EWG), 2 April. 2010, https://www.ewg.org/enviroblog/2010/04/spring-clean-your-cosmetics-go-without-these-6-ingredients. Sciammaco, S. “New Guide Warns of ‘Dirty Dozen’ Food Additives.” Environmental Working Group (EWG), 12 November. 2014, https://www.ewg.org/release/new-guide-warns-dirty-dozen-food-additives. This looks like an awesome recipe! 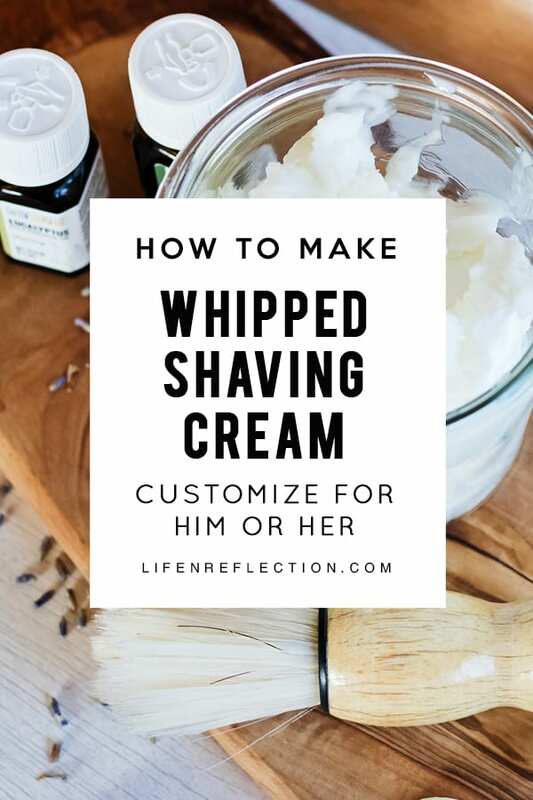 I have been meaning to make my husband some shaving cream and now I have no excuse 😉 Thanks for sharing! Happy to help :), he’s gonna love it! Finally…a recipe for shaving cream for women! 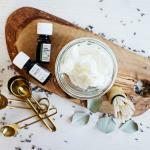 I can’t wait to make some of this shaving cream, but do you think frankincense will be ok instead of lavender? I really do not like the smell of lavender. Oh for sure, frankincense is wonderful for the skin too. And that’s the fun part of DIY you can make it just for you!! Thanks for sharing! I was literally thinking about this today then saw this post! Awe, what a coincidence. I know you’ll love it! This recipe sounds AMAZING! I can’t wait to try this. This makes a great DIY Christmas gift! Maia, it certainly does make a great DIY Christmas gift. And you can make it for the guys or gals on your list! Thanks for this idea. My partner has had really bad psoriasis on her legs and although it is pretty clear at the moment, it does flare up with certain skin care products. Hopefully this will keep her skin in better condition and keep her legs smooth! 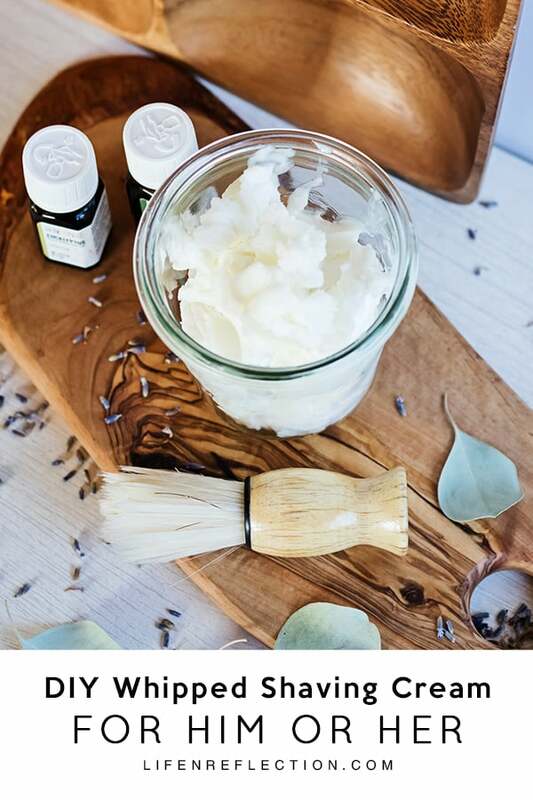 Katy, natural ingredients like the ones in this shaving cream can certainly help psoriasis. I hope she loves it!